Readers in southern Illinois, southeast Missouri, and western Kentucky will find this news more interesting than other fans who look at this. But I think this is good news for ALL wrestling fans. 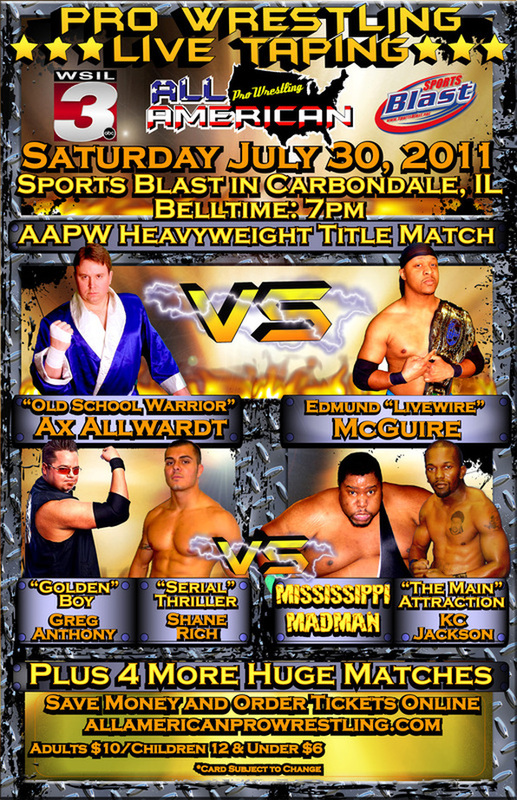 WSIL TV has picked up a bi weekly wrestling show called AAPW Collision. 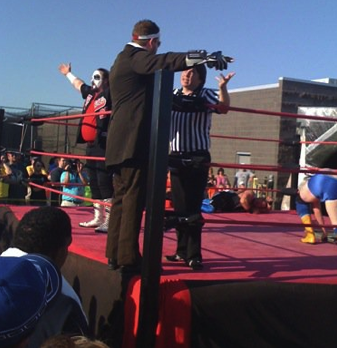 All American Pro Wrestling has been around for quite some time in southern Illinois. I've been to a couple of their shows, and enjoyed it. They've got a lot of local talent, who works hard to put on a memorable show. Guys like Livewire McGwire (who is the current champion), Heath Hatton & Curly (the tag team champs), Shane Rich, and the Mississippi Madman always make for an entertaining evening. Manager Gaylord Stephens and his man Ax Allwardt add a taste of "old school" to the show. This is the company's first venture into the world of television. Collision will make its debut on WSIL on Saturday, September 3 at noon. I'm particularly excited about this news, because AAPW's executive producer and announcer Chris Hagstrom has invited me to join him as a color commentator for Collision. Chris and I recently worked together and voiced the first episode that he used to sell the station on the show. It was my first time ever doing any kind of color commentary. Well, I take that back. In 1996, I recorded myself with a camera corder calling Wrestlemania XII. I'm pretty sure that tape has been destroyed. At least I hope it has. Doing any kind of work in the world of wrestling has always been a dream of mine. I've got to be a ring announcer for a couple of shows from IWA: Midsouth. I refereed a couple of matches for another local group. And most recently I was a guest "manager" for Impact Wrestling Knockout Velvet Sky. I'm very excited about this opportunity because it's a regular gig. There will be at least 13 episodes. 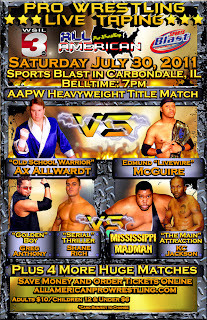 We'll be recording on July 30 at Sports Blast in Carbondale, so if you're in the region, come by. Doors open at 6, belltime that night is 7. Another reason I'm excited about this is because it's been a VERY long time since any kind of local wrestling has been broadcast on TV in this region. While this won't be like a Monday Night Raw or an Impact Wrestling show, it will give fans who love wrestling another outlet. Because it's going to be on TV, Collision will be seen by a wider audience, who up until now may not have known AAPW even existed. This will also give the hard workers involved with this company some recognition beyond the loyal fan base who shows up at the house shows. It's a win-win for everyone involved. I'm grateful and thankful to be in a position where I can help out, and hope Collision takes off and is well received by fans in the tri-state area. Who knows, maybe some of our stars will be seen and breakout to the next level. Thanks for reading and thanks for your support. Click here for more on AAPW. Very pleased to hear it. I've been going to AAPW shows and have known Edmund for a few years now, so obviously I'm excited. I've been interested in getting involved with them in some capacity too. Commentary would be a blast! Glad you finally got your crack at it.